Menches was a scribe from the town of Kerkeosiris and lived around 114BC â€“ his writings, on papyrus, were recycled as wrappings for mummified crocodiles, which were discovered at the beginning of the twentieth century. On the first day of this month at about the eleventh hour (about 5 p.m.) a disturbance occurred in the village, and on running out we found a crowd of the villagers who had come to the assistance of Polemon, who is performing the duties of epistates (superintendent or overseer) of the village. When we inquired into the matter, they informed us that Apollodoros and his son Maron had assaulted Polemon and that Apollodoros had escaped, but Maron had been put in prison and had appeared before Ptolemaios, the king’s cousin and strategos (military governor). We thought it well to notify the matter for your information. The 3rd year, Mesore 2 (18 August 114 BC). I’ve been working on a big project for Carlton Books which has taken up all my time and for commercial reasons I was not allowed to go public with the details until now. It is a hardback book called Egyptworld, aimed at age group 8+ and forms part of a series of books that have already sold over 350,000 worldwide. My job was to create meticulous double page illustrations of temple/pyramid recreations as well as every day life and all the scenes are populated with ancient Egyptian people going about their business. The book is due for publication in Autumn 2013. I made these images as 3D computer generated scenes and although Carlton owns the rights the actual illustrations in the book I own the 3D scenes. Carlton has given me permission to make series of new images from these scenes for myself but from a different perspective. If you would like to see ‘Opet Festival at Karnak’ click here. I must say a word of the thanks to Russell Porter and the team at Carlton who have been a joy to work with and have given me the opportunity to produce some of the finest works of art of my career. 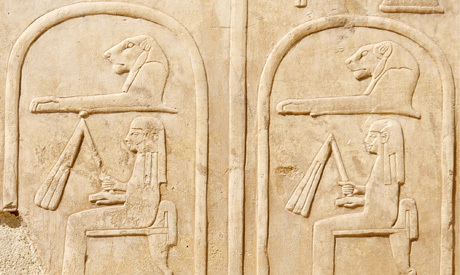 Explore Ancient Egypt – free on-line magazine. 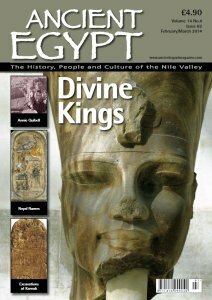 This well researched and illustrated bi-monthly Magazine covers a wide range of topics about ancient Egypt – An excellent resource. Over 1000 glyph illustrations including 400 Egyptian word examples and over 500 hieroglyphs from the Gardiner list. On Discovery Channel’s series, “Egypt’s Ten Greatest Discoveries,” discover how pharaohs defended their land and how they were seen in the eyes of the people. ‘Imagining Egypt’ has sold out world wide – Some secondhand copies available on Amazon. My publisher has mentioned printing a second edition or a paperback version but nothing certain as yet. I will keep you informed on developments. In the meantime my second book ‘Ancient Egyptian Anecdotes’ is still available in various formats. (see below). Heretic Pharaoh Akhenaten’s capital was no paradise for many adults and children.